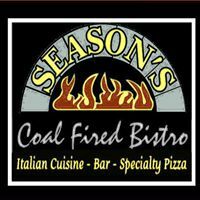 Welcome to Season’s Coal Fired Bistro. All of our pizzas are baked in our authenic coal fired ovens at over 800 degrees, the way the first pizza was made in Italy. We use only the freshest ingredients, including the finest meat and cheese available. Our sauce is made fresh daily from Italian plum tomatoes, and an aged-old recipe of extra virgin olive oil and Italian spices. We make our dough specifically for our ovens to give you a crust like you’ve never tasted before. All our pizzas are well done.